Lantronix Gateway Central™ is a secure, cloud-based device management service for the Lantronix IoT embedded and external device gateways. Powered by Lantronix MACH10® IoT software platform, Lantronix Gateway Central offers remote monitoring and maintenance of large IoT connectivity deployments using Lantronix IoT gateways, dramatically reducing field support costs and downtime while improving customer satisfaction..
Lantronix Gateway Central receives IoT connectivity data from Lantronix IoT gateways and renders it into dashboards and actionable insights to maximize the uptime and performance of your fleet of gateways. Configurable real-time alerts and notifications keep key personnel informed. 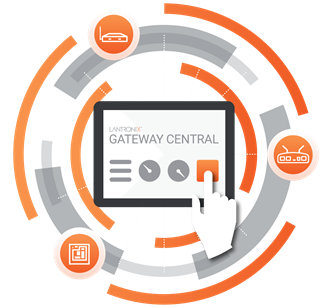 Lantronix Gateway Central enables remote configuration and firmware updates for Lantronix IoT gateways. Using the Google-like search, gateways can be grouped by several properties. Configuration and firmware updates can be scheduled per group to maximize flexibility. Dashboards show the status and distribution of configuration and firmware update tasks. Lantronix Gateway Central facilitates rapid deployment of Lantronix IoT embedded and external device gateways by applying custom configuration templates to gateway groups. These configuration templates can be created or modified based on the software parameters of an existing gateway or from scratch using XML. Interactive web interface requires no special software. Authenticated users only have access to authorized devices. Console messages logged for audit and control.